Each account must be assigned to a Calling Plan which is charged monthly. This determines the services included in the monthly charge. There are two different plan types which your platform can manage, Bundle Plans and Pay-As-You-Go Plans. Bundle Plans, offers the customer a set amount of services for a monthly fee. Example: Kickstart Plan is $38.80 and the customer gets 1 number, 2 channels, 4,000 Local and National minutes and 100 Mobile minutes. Pay-As-You-Go Plans, offers the customers standard calling rates so they get charged for the calls that they make only. And all numbers and channels are charged at monthly costs. Example: SIP 5 Plan the customer gets charged $0.40/minute for Local and National minutes, $0.18/minute for Mobile calls, and have a rate card for International minutes. All numbers and channels are charged additionally monthly. By Publishing a plan, your customers will be able to see them and change the plan they are on to an plan that is published. Give your plans names that refer back to what you are offering and you company branding. This is the monthly charge for the plan. This price needs to be GST exclusive. You can offer the Number Plans to come as apart of the Calling plan. 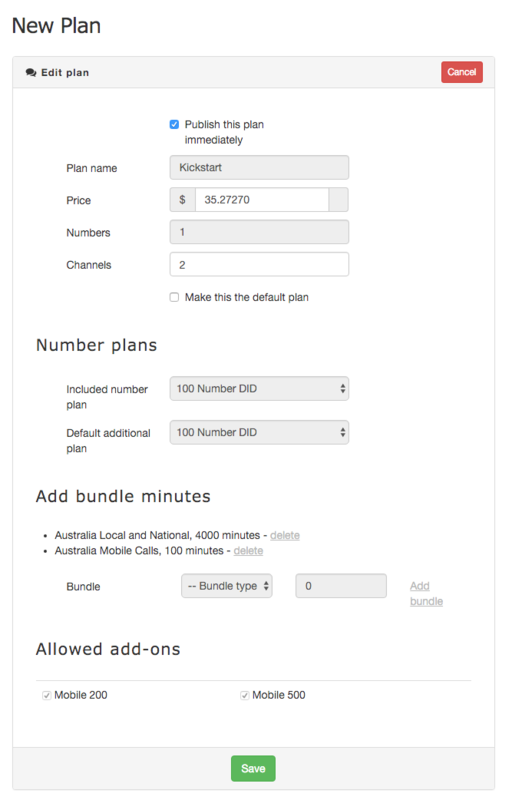 In this example we have added 1 Number Plan as a apart of the Kickstart Bundle Plan. Every number needs to be assigned 2 channels so that the customer can use the PBX function. The number of channels on an account will reflect the number of calls that can be made on the account. This this example the Kickstart plan has includes 4000 Local and National minutes and 100 Mobile minutes.